New high-tech research shatters Van Gogh myths! Digital version shows what may be the original lilac walls. The painting as we know it with blue walls caused by faded red pigment. Myth: In Van Gogh’s beloved painting of his bedroom in Arles, France, the walls were originally painted blue. Truth: Not true! 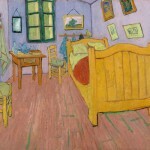 Van Gogh originally painted the walls a pale lilac, not blue! He experimented with new pigments. These new pigments, particularly the color red, proved to be unstable and the red pigment disappeared after a short time. Van Gogh mixed this new red pigment with blue to make lilac. With time the red faded and left the blue. Hence, blue walls. Why is this important? Van Gogh was very precise about complementary colors (colors that go well together and are pleasing to the eye.) The main color theme in the bedroom is yellow. The complementary color of yellow is purple, not blue. Van Gogh knew what he was doing! Next time you see a Van Gogh and see the color blue…look closely…is there an abundance of yellow in the painting? Solve the mystery yourself! Truth: He was a very experienced artist (he made 900 paintings in ten years) and doggedly honed his skills. He created very deliberate compositions. 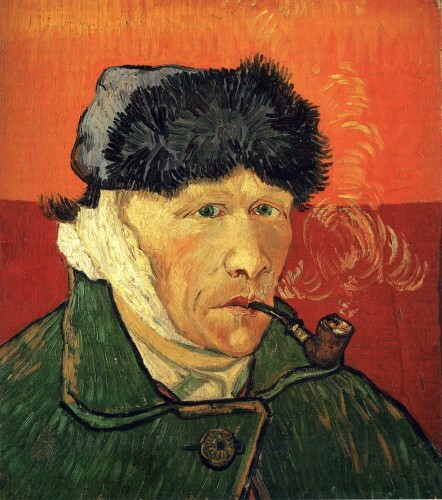 Myth: Van Gogh cut off his whole ear. Truth: Not exactly. In a fit of madness Van Gogh only cut off a portion of his left ear lobe…not his entire ear as many believed. Myth: Van Gogh never sold a painting in his lifetime. 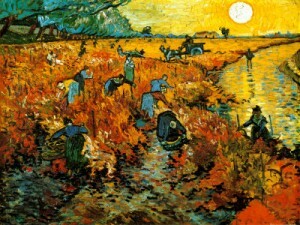 Truth: Van Gogh sold only one painting during his lifetime, Red Vineyard at Arles. This painting now resides at the Pushkin Museum in Moscow. Sit back and marvel at the masterpieces of Vincent van Gogh. I continually learn from you!!! Thank you for sharing your love of art and your vast knowledge. Do you have a favorite van Gogh, Stuart? LOVED looking at the video! Saw pics I hadn’t seen before. He is mine & most people’s favorite. What color & movement! Thanks so much. My favorite, too, Margo. The Van Gogh Museum has just opened again in Amsterdam after a 10 yr renovation! Quite an amazing artist. I had no idea he was so prolific. I did “sit back and enjoy the show” Very much. Your “myth v. truth” section was novel and informative. Thank you very much for sharing this fascinating artist w/ me. Wish I could have written more…..he was such an interesting guy! Great, Kirby! Vincent’s work is so refulgent with mythologies, and you’ve nailed some. (In fact, the only painting he sold was to a fellow artist’s sister, Eugene Boch, and she probably bought it as a courtesy, to acknowledge that Vincent had painted her brother.) Could we ever exhaust our knowledge of Vincent van Gogh??? Thank you so much, Linda, for the information as to who bought Van Gogh’s painting. I tried to find out that info but could not. Great selection of Van Gogh, including many I’d never seen before. The texture of some of his landscapes is amazing! They practically wiggle off the screen. Wiggle is a great way to describe van Gogh’s marks! Impressionism is my favorite art style. An iconic name that immediately represents this form is Van Gogh. Oft clouded in extreme misrepresentation of his persona, your description of fact versus fiction is just great. Passionate yes. Mad no. Driven yes. Maniacal no. I very much enjoyed all parts of your blending word with image, thought with admiration for a great talent. I loved your blog on Van Gogh. On a recent trip to France, one of our favorite places was the St. Paul’s Monastery close to Arles in Provence. It was the mental institution where he lived for the last part of his life, completing 150 paintings. It was very peaceful ( it is still a mental institution), and we could see why it was so inspirational to him We saw the actual places ( like the bedroom you pictured, the landscape, and the skyline of St. Remy) with his paintings next to them. ( Like the Starry Night). Your story about the colors he selected was interesting. Keep up the interesting work! So fascinating, Martha. Thank you for taking us on a trip to Arles! What do you suppose caused his madness. I would be interested, as often I wonder how much madness I have. Artists just have that certain craziness. We all have it! !